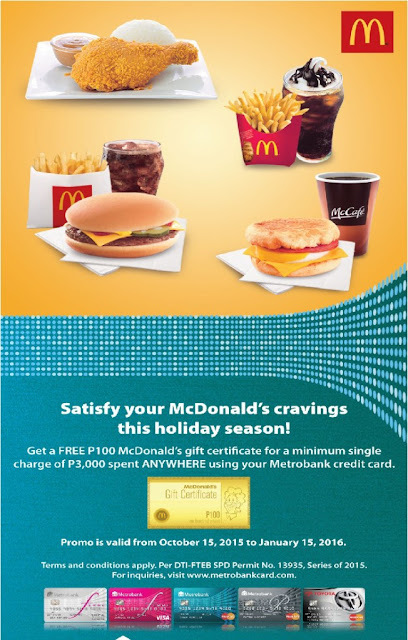 FREE McDo GC w/ Metrobank ~ Philippine Freebies, Promos, Contests and MORE! Craving for McDo meals? Metrobank gives you the chance to satisfy your cravings with FREE McDo GC. For every P3,000 minimum single spend using your card, you will receive a P100 McDo gift certificate which you can use at any McDonald's store nationwide. To redeem, simply present your card and surrender your charge slip transaction at any McDonald's outlet. You can redeem a maximum of one (1) product per valid card per visit at a branch. You can also use the GC in any participating store transaction. Just a reminder: Splitting of transaction to reach the required amount is not allowed.